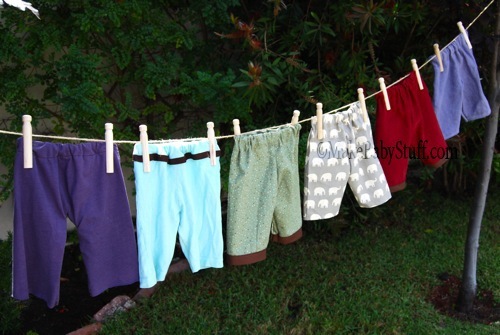 Use this simple baby pants baby pattern and you'll have some funky pants in no time at all! I highly recommend cutting out a pattern template from cardboard so you can just trace your pattern again and again. 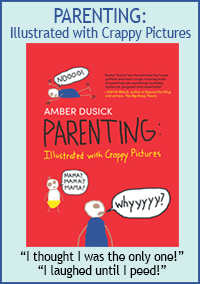 As your child gets older, you simply add a few inches in width and height to your template. UPDATE: Due to popular request (it has to be the #1 email I get I swear) I've added two different sizes to our new & improved pattern, 0-3 months and also 6-12 months. These patterns are now actual size on PDFs and will print on two sheets of paper. Here is the Free Baby Pants Pattern PDF, Size 0-3 Months and here is the Free Baby Pants Pattern PDF, Size 6-12 Months for you to print. As with all of our patterns, they are copyrighted and for your personal use only. Instructions: Begin by tracing your template twice, once for each leg. Then cut them out so that you have two matching pieces. Set the template on the fold of your fabric. If you plan to leave your pants plain, you can skip the next few steps and start sewing them together. However, I like to add cuffs on each leg and pockets at this point to save time. 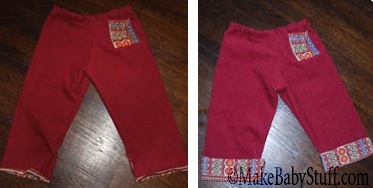 I make my pants extra long and add a lining fabric on the inside of each leg so that they can be turned up and cuffed. As my child gets taller I no longer cuff the legs, so he gets a very long wear time out of these, which I want out of handmade stuff! So if you are adding trim to the bottom, you can use a few different methods. Either sew the trim directly on the outside of the pants or sew them on the wrong side of the pants so that they can be turned up, or cuffed. Here is the way I sew the cuffs to the bottom of my pants! Then, sew on pockets or other embellishments. I like to match my pockets with my trim but you can get creative with this! For a simple square pocket, I simply turn the edges under, iron them flat and then stitch on the pocket. Next, begin sewing the legs. Turn each piece inside out so the wrong side of the fabric is on the outside. Sew from the ankle up to the crotch and then stop, leaving 1/2 inch from the edge. 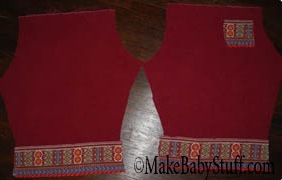 You should now have the two matching halves to your baby pants as shown below. Now match up the two halves and sew from the crotch up to the waistband on the front and then the back of the pants. It is best to sew from the crotch to the waist because if there is any unevenness in your pattern you can "fix" it when you turn over the fabric to make the waistband. It is much harder to deal with excess fabric in the crotch. Finally, you should have what looks like a pair of pants! Almost done! Leave the pants inside out and fold over the very top to create the waistband. Leave enough room for your elastic and sew all the way around the pants. Cut a tiny hole on the inside of your waistband. Insert a big safety pin through one end of your elastic and then "snake" it through your waistband. Bunch up the fabric on the pin, and then pull it all the way through. Sew the ends of the elastic together, turn your pants right side out and you are all finished! If you created cuffs, turn the cuffs up and press with an iron. The beauty of this very easy pattern is that the "look" of the pants depends entirely on the fabrics you pick! You can use funky, wild prints for something fun or solid colors for a more dressy look. Have fun & happy sewing! Back to the top of the Free Baby Pants Pattern page.